Vision Vapros Spinner 2 VV Battery has more comfortable and ergonomic spin dial for adjusting the voltage, upgraded battery cell of 1600mAh, adjustable voltage from 3.3V to 4.8V. Colors for option. The battery is turned on/off by pressing the button 5 times in 2 seconds. When the battery is off, the button flashes 3 times in mixed color to indicate that battery is activated after pressing the button 5 times in 2 seconds. When the battery is on, the button flashes 3 times in mixed color to indicate that battery is off after pressing the button 5 times in 2 seconds. 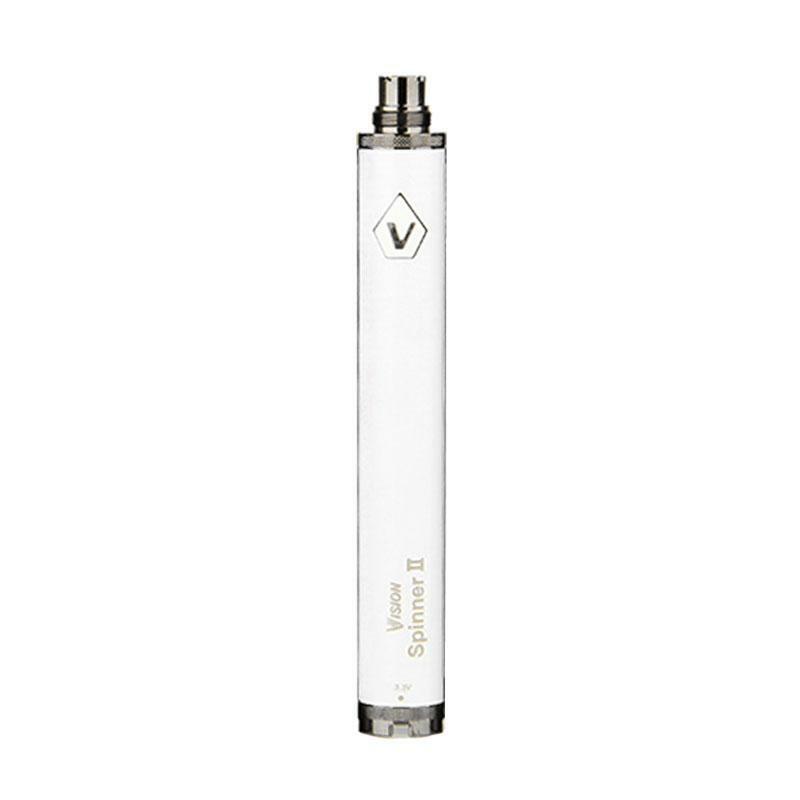 Vision Vapros Spinner II is capable of outputting voltage from 3.3v to 4.8v. The bottom scale indicates the position of voltage output level. Rotate the bottom spin to align the red line with the bottom scale to arrive the voltage output level as marked in number. The red line on bottom spin can stay at any position along the scale between 3.3v and 4.8v to fine-tune your voltage output, despite the four locking position at 3.3v, 3.8v, 4.3v and 4.8v. Please be aware that the red line moves between 3.3v and 4.8v along the scale and do not push the red line on bottom spin to go over the 3.3v clockwise and 4.8v counter-clockwise; it may damage the battery if being pushed forcefully. Spinner II could display three colors from the button to indicate the battery usage level. If the button displays WHITE color being pressed when battery is on, it indicates a remaining 60%-100% battery power. If the button displays BLUE color being pressed when battery is on, it indicates a remaining 30%-60% battery power. The button flashes fifteen times in mixed color to indicate that there is no power at all left in battery and it can no longer function without being properly charge. Simple yet solid battery from vision. Vapros spinner battery, worth buying. Nice shop by the way. This is my second vapros spinners ego battery. I love them so much. Very easy to adjust the voltage and good battery life.